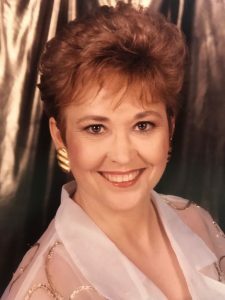 Nola “Jeannie” Slay, 71, a twenty five year resident of Santa Fe, TX passed away Monday April 14, 2019 in Houston, TX. Jeannie was born on July 4, 1947 in Pasadena, TX. She was a member of Bay Area Church and volunteered in the nursery for over thirty years and also was in the sowing group at her church where they made quilts as an outreach ministry. Mrs. Slay also worked for P.S.I. in Houston for twenty two years. Mrs. Slay is preceded in death by her parents Milton and Doris Stayton; three sisters Phyllis Deaton, Gail Warlow and Dottie Stayton and brother Mike Stayton. Jeannie is survived by her husband of fifty years Floyd Slay; three daughters Theresa “Tassie” Campbell, Tammy Tepera, Trisha O’Keefe and husband Jason; son-in-law Jeff Campbell; four grandchildren Kaycee Campbell, Colton Campbell, Dylan Tepera and Daylyn Tepera; two great-grandchildren Heidi Campbell and Thad Skipper. There will be a visitation on Tuesday April 16, 2019 from 5:00 pm to 8:00 pm at Crowder Funeral Home, 851 FM 517 Dickinson, TX 77539. A Funeral Service will be 10:00 am Wednesday April 17, 2019 at Bay Area Church 4800 W Main St. League City, TX 77573 with Pastor Zachary Ashley officiating. Burial will follow at Forest Park East Cemetery in Webster, TX. Pallbearers serving will be Colton Campbell, Jeff Campbell, Jason O’Keefe, Dylan Tepera, Toby Null and Jimmie Null. Momma it’s just not the same without you. All the bad things that have happened I always went to you and got through them because of you. I need you now to get me through this… I miss you so much! Thank you for being the most amazing mother anyone could ever hope for. I’m 48 it’s crazy how much I still need you. I Love Uou So Much and will see you again one day! Tammy and Dylan my heart grieves for your loss. God give you strength to get through this sad day. The sweetest, most beautiful, and loving friend a person could have. We are thankful to have been a part of her life. Till we rejoice in heaven together. Such a beautiful lady. So thankful we had the please of meeting her. Trish and Family, I did not realize your mother and my mother shared the same birthday. Your mother was a “Firecracker ” also! God needed another Firecracker so she was called upon to help God. I am so sorry for your loss of such a special person!!!! My name is Ray McInnis and I was the PSI manufactures representative in New England for 20 years. Jeannie was my inside sales person for many of those years. She was such a professional and someone that I always enjoyed speaking with about work and whatever else popped up! I had so much respect for her that, like many others in the PSI family, I made the trip to Houston for her retirement dinner. May she Rest In Peace. My condolences to you all. Hi Ray! I’m Tammy Jeannie’s daughter I use to go to PSI with my mom growing up because I could never leave her side. I wanted to thank you for taking the time to post these kind words about my mom. I always remember watching her work and talk on the phone to all the customers and so many of them only wanted to talk to momma, I was always impressed by her! Thanks again! My heart goes out to you all, I’m in disbelief and sorrow. She had a personal relationship with our Lord, and I hope knowing that, you will find some sense of peace in your heart knowing she has no pain, no struggles and is at peace. She fought a tough battle! Hugs and prayers to all of you! Another beautiful angel entered Heaven. She was a very special lady and beautiful inside and out. I have so many special memories of her that I will always cherish. Prayers and hugs for Floyd and the entire family. Heaven’s gain is certainly our loss. Jeannie was a beautiful person inside and out. Even in the midst of her illness, she was always so concerned about others. She will be sorely missed in our Life Group at Bay Area Church. I pray for God’s peace and comfort to descend on Floyd and the rest of the family. Jeannie was such a beautiful person inside and out. Even in the midst of her illness, she was always concerned about the welfare of others. She will be sorely missed in our Life Group at Bay Area Church. I pray for God’s peace and comfort to surround Floyd and the rest of the family. Sweet Jeannie will be missed by all who were lucky enough to have met her. She was truly a good person who loved the Lord and you would know that by watching her live her life. Full of fun she was and so easy to fall under her spell as she drew you into her family of friends. Wonderful friend who now is with her Savior. I wished that we could have spent more time with Jeannie and her family. Jeannie was like a second mother to me. She and Floyd always treated me like I was one of their own and I will never forget that….I love them and their family very much and it is devastating to hear of Jeannie’s passing…..I praise God that I had the honor and privilege to be apart of NOLA JEAN’S life. May the Lord Jesus Christ grant her peace and ever lasting life in the Kingdom of the Lord. We are heartbroken at the loss of dear, sweet Jeannie. We grieve for the hole it will leave in her familys’ hearts. Many happy memories over the years of Jeannie which we will cherish. Till we meet again. Jeannie has always been the sunshine on Hammond lane…our beautiful and most loving person, neighbor, friend, and optimist! Her belief in God and brotherhood was evident in every aspect of her life. An amazing servant of our lord Jesus Christ.